Disclaimer: This post was sponsored by Minted. As always, all thoughts and opinions are my own! 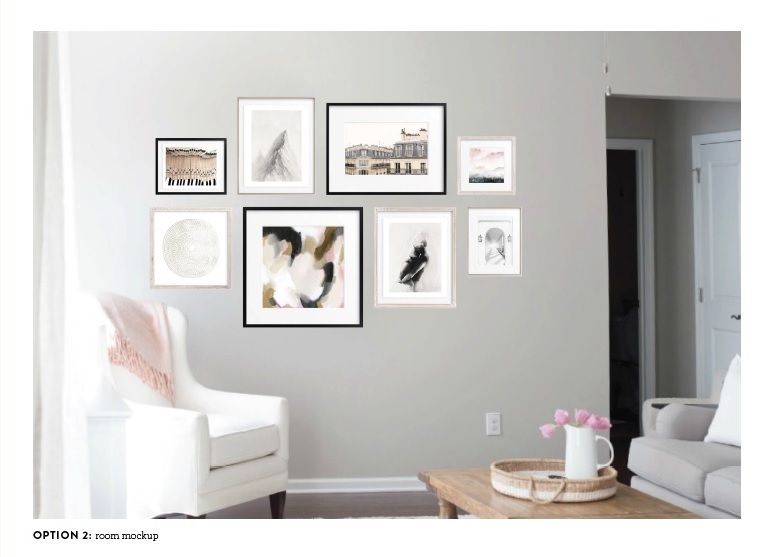 This week it was all about the gallery wall! If you asked my husband for one of my worst qualities, he'd probably say my indecision. In high school I had big dreams to become an interior designer, and luckily for myself and others that didn't happen because all of my clients would have unfinished spaces. Oops! I knew I wanted to move our family photos to our loft space and replace them with fine art, with a few family photos mixed in, but I was overwhelmed at the options. Enter: the sweetest Minted Art Stylist, Cherie. 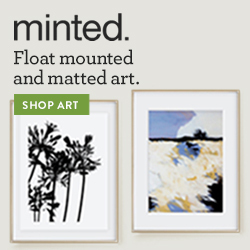 In case you're unfamiliar, Minted offers personal art styling for those of us that need a little boost in our decorating skills. There are a lot of perks besides not having to wrack your brain for the perfect art combination or spend hours looking through all of the pretty fine art options. 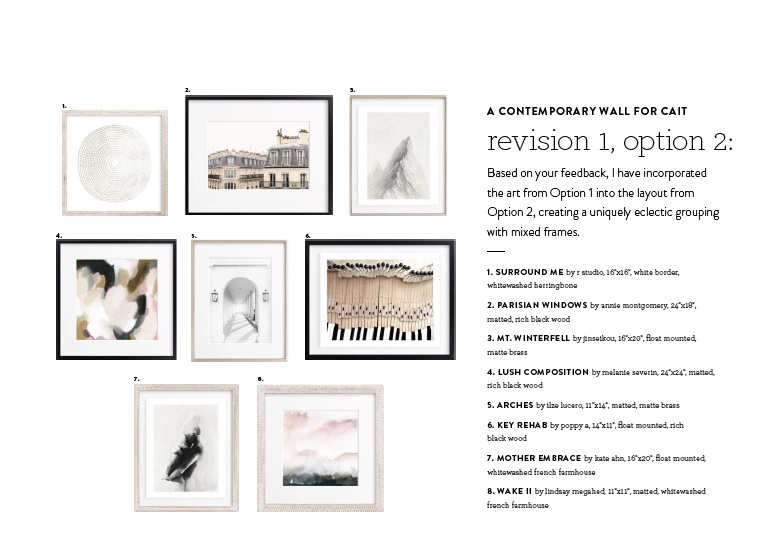 As part of Minted's art styling process, you receive 2 custom concept boards, 2 additional revisions, a full rendering of your wall with each option provided (for visual people like me this helped a TON! ), and a 20-25% discount plus free shipping on your purchase! You aren't required to buy everything, in fact to keep our gallery wall within my budget I opted to buy just the art and use my own frames for a couple of the prints. To start you take a fun, quick quiz telling them what space you need art for, what your decorating style is, and the color palette. I think I selected contemporary, classic, and vintage if I remember correctly... this seemed to fit the overall Modern Farmhouse style I am going for. Then I emailed Cherie an image of the wall and the exact dimensions she was working with. Honestly she nailed it. I loved every piece of art, the subtle hint of blush in some of the pieces, and the mix of frames. I had my heart set on art shelves, but the second option she provided was so gorgeous I almost opted for that instead! Seriously how sweet is that Mother's Embrace print? I asked her to tweak a couple things, like add a mat to the Parisian Windows print, and she sent a new rendering of the wall so I could see how it would look. I happily approved, so she sent me final hanging instructions and all of the details I needed to place my order. I can't wait to share more progress next week! 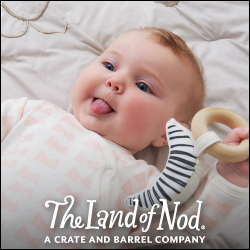 In the meantime my next to-dos are to find some bamboo shades to add texture, replace the rug, and find pillows that are toddler friendly (i.e. machine washable). If you have any questions about the personal art styling process, feel free to reach out! 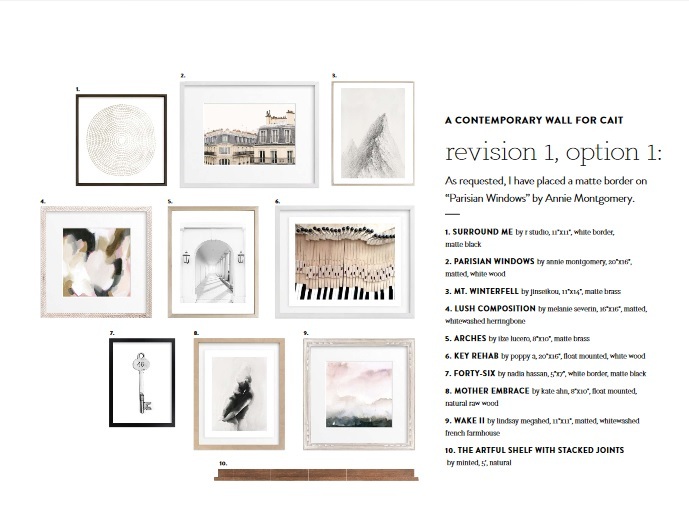 I highly recommend it for a perfectly tailored gallery wall if you're stuck like me! 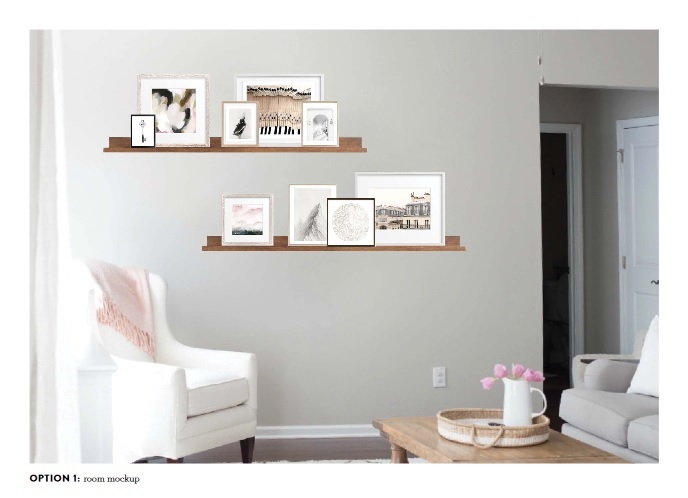 Thank you so much to Minted for working with me on this space! Wow. This is genius! I love gallery walls too, and I think I am getting better at them, but this is perfection! I want to do something like your option 1 in our master bedroom now, thanks for the inspiration! How fun that you're doing the ORC! Love the cluster in the second orientation! Can't wait to see it all come together! How awesome! I didn't know Minted offered this. Beautiful space!